First of all, thank-you for all the great posts and information on this website, you have made my K100 build a lot easier. I'm having an issue getting my K100 to start. For the past few months I've had absolutely no issues, the bike would turn over and start first time every time. However, I was out for a ride on Sunday and after about 10 miles the bike started cutting out anytime the revs went below roughly 1k, I couldn't get it to comfortably go above 3-4k without it juddering. When I eventually got the bike home I left it for a while then went out to try start it, no joy. It keeps turning over and every so often lets out a slight grunt as if it's trying but won't go the full way. My first thought was that the bike was starved of fuel, I had recently removed the tank and thought maybe upon putting the fuel hose back on, I had damaged the lining. I replaced the fuel hose tonight (taking of air filter etc) but still the same issue... is it possible I have let air in to the system or damaged the filter? On a (hopefully) unrelated note, when I leave the bike for a while on the centre stand there's white smoke when I start it up. First check to see whether the spark plugs are wet or dry. The 4 pin connector under the RH side of the tank that supplies power to the pump is a known source of problems. If the bike is stored in a cold place the white smoke could be water condensation. I will need to check, I've had the bike for a year and I haven't changed it yet. @MartinW wrote: First check to see whether the spark plugs are wet or dry. The 4 pin connector under the RH side of the tank that supplies power to the pump is a known source of problems. If the bike is stored in a cold place the white smoke could be water condensation. I will check the spark plugs tomorrow, the 4 pin connector is ok, I recently cleaned all the wiring up on it and the pump seems to be running fine. Thanks. For how long has the white smoke on start up been occurring? Does it occur other times than just at startup? @Laitch wrote: For how long has the white smoke on start up been occurring? Does it occur other times than just at startup? It usually keeps smoking until I ride it. As soon as I get the wheels moving it will disappear. However, if I leave the bike for even 24 hours then start it up in my garage the white smoke will come back. Check cooling system level are you using coolant? Just keep an eye on your coolant in case you are losing some. Watch the coolant bottle but also keep an eye on the filler at the radiator. That means sliding the tank back a little, something you can do if you put new longer fuel lines on it. If you still have original fuel lines that something you need to do as they crack with age. But rather weirdly many years back a car I had always gave off loads of white smoke on start up, never lost coolant or issues. But this time of year the white smoke is likely to be the exhaust gases being warm hitting the cold air and immediately condensing the water vapour into fog. If you are running rich this is more likely to happen too. @92KK 84WW Olaf wrote: Just keep an eye on your coolant in case you are losing some. Watch the coolant bottle but also keep an eye on the filler at the radiator. That means sliding the tank back a little, something you can do if you put new longer fuel lines on it. If you still have original fuel lines that something you need to do as they crack with age. Thanks for the advice. I've just bought some new coolant, I'll drain the existing and replace it with fresh stuff tomorrow and see if it helps. I've also just purchased a new fuel filter and new spark plugs from motobricks, which will hopefully fix the starting issue. A tip if you are draining coolant. Don't use the drain plug, open the hose off the water pump instead and drain it out there. Flush it with a slow running hose into the radiator filler. Don't forget to put the hose back! Put in a full 2 litres of coolant and top it off with DI water up to level, that way you don't have the hassle of measuring and mixing coolant and you will have the right quantity of coolant in it. You need to lean the bike left and right to get the air bubbles out and turn it over [the engine, not the bike]. The dribble of coolant left in the container with about 200ml of DI water will go in the coolant reservoir. If the sight tube on the reservoir is darkened see about a clear piece of tube as a replacement. @92KK 84WW Olaf wrote: A tip if you are draining coolant. Unfortunately I only bought 1L of coolant to top it up, or else I would have drained the whole thing. @rxbbie wrote: My first thought was that the bike was starved of fuel . . .
What is the model and year of your bike, rxbbie? Changes in components occur various years. If you put the year and model of your bike in your profile, it will show up beneath all your posts. That way members won't need to backtrack to find out what's being discussed. If you have enough coolant to top up the system and fill the coolant reservoir to a suitable gauge level, that's all you need right now. Martin suggested that you determine if the plugs are wet or dry after failure to start. What were the results of your doing that? Wet plugs would indicate overfueling. One of the causes of that is defective coolant temperature sensor operation. Olaf suggested being aware of the coolant level in your bike's coolant reservoir. That would also require your filling the coolant reservoir to between the Min and Max levels on its tube gauge once the radiator is topped up. Have you done that? A reason to do that would be to determine if the "white smoke" is from coolant leaking through a blown head gasket into a combustion chamber when the engine is warm. A coolant level drop in the reservoir's gauge could eventually indicate that if viewed when the engine is cold. I will add a little tip too, make sure the coolant in the radiator cap is up to the top. However it can still drop slightly as air is expelled/extracted. This will cause the coolant reservoir to drop slightly. Not normally an issue unless you are monitoring for head gasket problems and you end up getting a false reading scare. So its worth going back after a few hundred miles and topping it off. Then run your coolant checks on the sight tube. That's why I like a nice new sight tube, gets even easier if you have almost pure coolant in it too, easier to see. @92KK 84WW Olaf wrote: I will add a little tip too, make sure the coolant in the radiator cap is up to the top. However it can still drop slightly as air is expelled/extracted. This will cause the coolant reservoir to drop slightly. Not normally an issue unless you are monitoring for head gasket problems and you end up getting a false reading scare. So its worth going back after a few hundred miles and topping it off. Then run your coolant checks on the sight tube. That's why I like a nice new sight tube, gets even easier if you have almost pure coolant in it too, easier to see. So I should top the filler cap under the tank up to full, then fill the overflow tank to a suitable level also? Yes. Fill the coolant reservoir to a level between the Min and Max lines. Thanks, I feel like an idiot now. I installed a new coolant reservoir but I thought it was an overflow tank so didn't fill it at all. This might be the problem. @rxbbie wrote: Thanks, I feel like an idiot now. I installed a new coolant reservoir but I thought it was an overflow tank so didn't fill it at all. This might be the problem. You aren't an idiot although it's good to be in touch with your feelings—so I'm told anyway. You're inexperienced. You should have at least two manuals to use while working. One might clarify the other. They're downloadable all over the place. 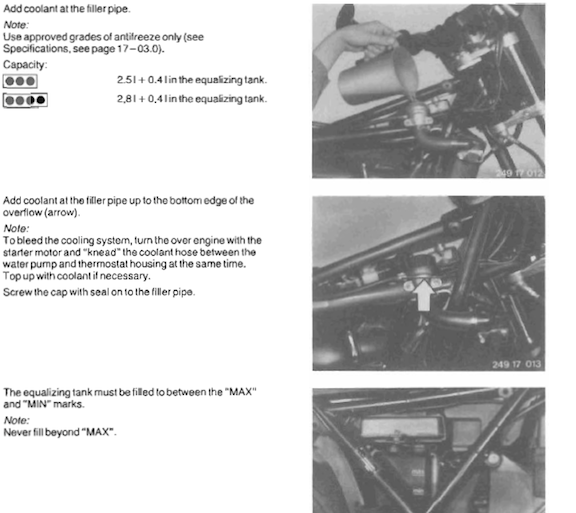 Here's an extract from a BMW workshop manual download. Methods in it will work and Olaf has offered alternatives. We have all likely been there at some point, which is why we share experiences on the forum. There is nothing like organic learning to give one some degree of confidence and a willingness to try other tasks. Also keeps us out of trouble down the road. Asking questions and sharing information is the key so don't be afraid to ask questions. The forum is there to help those inexperienced with Ks with or without other experience so we all learn from each other. Anyway isn't it a good outcome if all the issue was is a mistake!!!!! @92KK 84WW Olaf wrote: We have all likely been there at some point, which is why we share experiences on the forum. There is nothing like organic learning to give one some degree of confidence and a willingness to try other tasks. Also keeps us out of trouble down the road. Asking questions and sharing information is the key so don't be afraid to ask questions. The forum is there to help those inexperienced with Ks with or without other experience so we all learn from each other. Indeed, thanks for your help. I just need to sort the main issue now which is the bike not starting! After the failure to start are the spark plugs wet or dry? This information is needed to determine the next step. @MartinW wrote: After the failure to start are the spark plugs wet or dry? This information is needed to determine the next step. Apologies, I've not had a chance to check the bike yet. I'll check the spark plugs tomorrow. Put the new spark plugs in and changed the fuel filter also topped up the coolant to the proper level and the bike started up no problem. Could the low coolant level and wet spark plugs be related? @rxbbie wrote: Got the spark plugs out today, they were very wet. (See pic below) Could the low coolant level and wet spark plugs be related? They're on the same bike so that makes them related, but besides that, I don't think so. What were the gaps on the old plugs you replaced? It looks mighty wide on the one in that photo. That might inhibit ignition and give them a fuel bath. The bike looks like it is flooding. Remove the No 6 fuse marked Kraftstoppe , this will disable the fuel pump stopping the pump from supplying more fuel while you try and start it. Try and start the bike it should start on the residual unburnt fuel residing in the combustion chamber. The bike should start, and as the bike starts to die ram the fuse back in. As it requires someone to manipulate the throttle a second person is handy. The bike should be running albeit badly, it and will require a lot of throttle manipulation to keep it running. If this succeeds the problem is probably a faulty temperature switch or temperature switch connection. test and clean both. The test values are on this site. I have managed to limp home with this condition, by sticking to back roads. If you don't have a second pair of hands to do the #6 fuse thing, another way to get started is to unplug the the four pin fuel tank connector and crank the engine for about 10 seconds or until it tries to start. This will pump the excess fuel out of the cylinders and dry the plugs enough to fire. Reconnect the tank and start the engine. If your bike has the Motronic ECU with the interlock that prevents the fuel pump when the sidestand is down, you can put the bike on the centerstand with the side stand down, crank the engine until it tries to start on the residual fuel and flip the sidestand up to start the fuel pump. @Point-Seven-five wrote: If you don't have a second pair of hands to do the #6 fuse thing, another way to get started is to unplug the the four pin fuel tank connector and crank the engine for about 10 seconds or until it tries to start. This will pump the excess fuel out of the cylinders and dry the plugs enough to fire. Thanks for the info. Is the point in this to temporarily burn any excess fuel resting in the engine? Is there any reasons as to why the plugs would flood in the first place? I can't say for sure why my bikes flooded(it's happened to me twice in about 45,000 miles). It happened to me on a cold start each time. 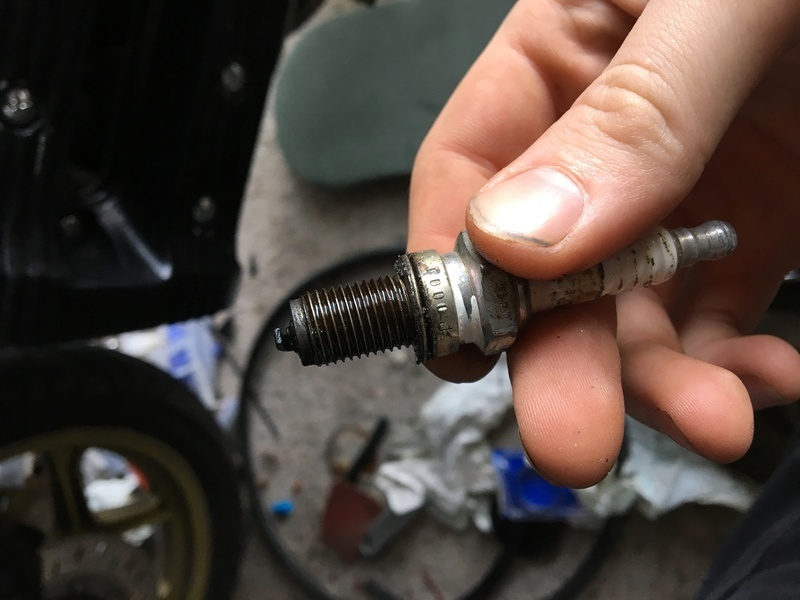 I suspect that the rich mixture on cold start floods the spark plugs preventing a spark hot enough to fire the mixture. Continuing to crank the starter just puts more fuel in the cylinder making the situatuion worse. Cranking the engine with the pump shut down blows the excess fuel out of the cylinder until what remains can be ignited. Because the mixture has been enriched by the ECU it is important that the throttle is NOT opened when starting. ......but have a wide open throttle when turning the starter to dry the plugs. So keep the throttle open when starting the bike and then close it when it turns over? I had planned a ride today, is it safe to ride the bike or do I just risk damaging the bike again? If it starts using either Point Seven Fives procedure or mine, the possible cause is the temperature sender or it's connector. Clean and test. This fault will give faulty information to the ECU causing it to add more fuel.